Raisin contains iron, potassium, calcium, magnesium and fiber. Therefore, it is beneficial for health. Weakness: Raisin contains glucose and fructose, which increases energy level and weakness decreases. Anemia: It has high amount of iron. It is very beneficial in anemia. Blood Pressure: Raisin has high amount of potassium. Its regular consumption controls high BP. Digestion: Chewing soak raisin is beneficial in constipation. It improves digestion. Fever: It has antibacterial properties, which is beneficial in fever. Joint Pain: It has boron, which is effective in joint pain. 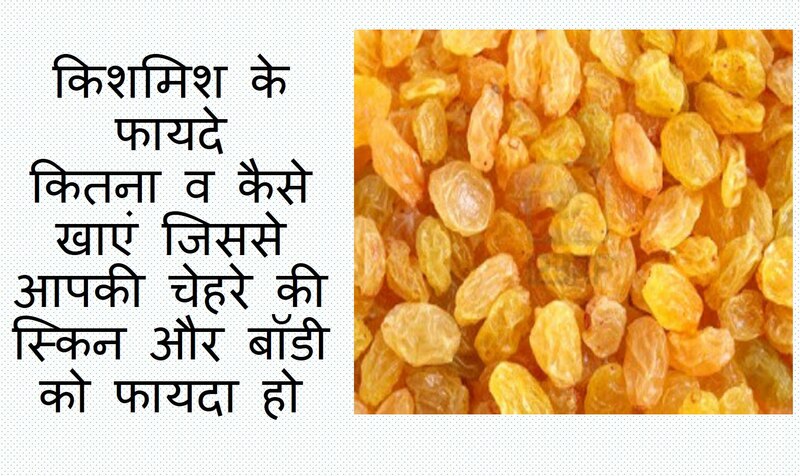 Vision: Raisin has beta carotene, which is effective to increase vision. 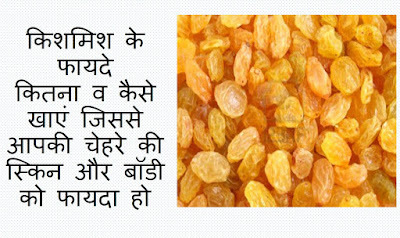 Throat: Soak raisin is very beneficial in sore throat. Heart Problem: Raisin reduces cholesterol level and protects us from heart problem. Cancer: It has antioxidants, which reduces the risk of cancer.